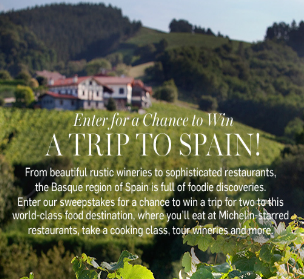 Williams-Sonoma Win a Trip to Spain Sweepstakes – Win a trip for 2 to Spain! Win a trip to Spain! ENTRY LIMIT – Limit: Each participant may enter only one time during the Promotion Period. ELIGIBILITY – The 2016 Williams-Sonoma Win a Trip to Spain Sweepstakes is open only to legal residents of the fifty (50) United States (and the District of Columbia) who are at least eighteen (18) years old at the time of entry. SWEEPSTAKES ENTRY PERIOD – The Sweepstakes begins on July 15, 2016 at 12:00 a.m. United States Eastern Time (“ET”) and ends on August 19, 2016 at 11:59 p.m. ET. Approximate Retail Value (“ARV”): $4999 USD.